Seattle mayoral candidates weighed in this week on whether the police department can adequately investigate officers using deadly force. Can the Seattle Police Department adequately investigate incidents such as the fatal shooting by officers of Charleena Lyles? Or is more community involvement needed? 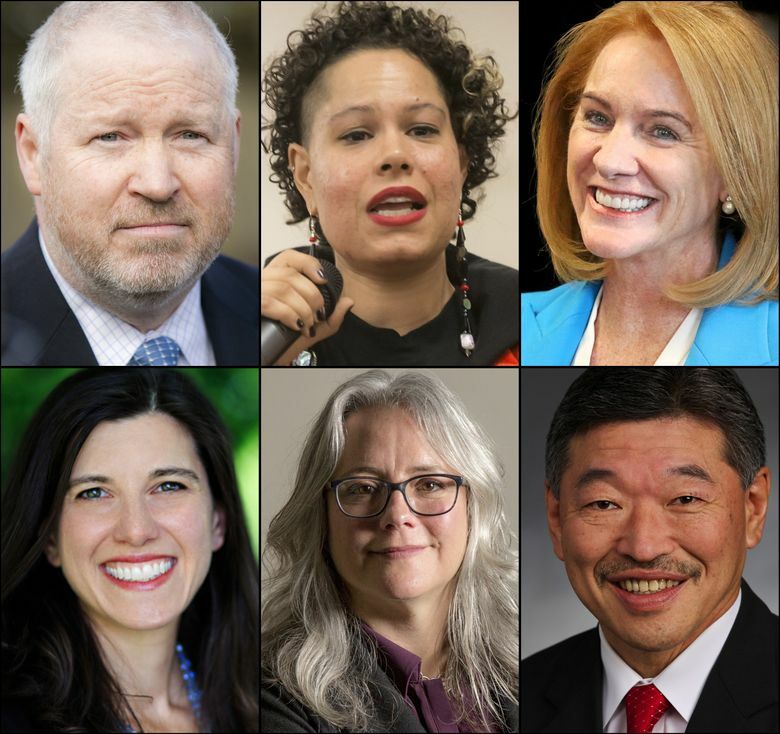 Leading candidates for mayor answered differently this week during a conversation with The Seattle Times’ editorial board. The questions were first directed at attorney, educator and activist Nikkita Oliver, who had raised concerns about the investigation into Lyles’ death at a City Council hearing Tuesday night. “The community does not trust that police can effectively investigate police,” Oliver said during the editorial board conversation. While Seattle’s Community Police Commission can recommend institutional and cultural changes in the Police Department, the commission is underfunded and isn’t directly involved in investigations, she said. “If we’re going to repair the history-long damage of policing, especially in over-policed neighborhoods, we must develop mechanisms that actually give the community an effective voice,” Oliver said. Jenny Durkan, who as U.S. attorney for the Western District of Washington worked on Seattle police reforms, expressed more confidence in the existing setup. Durkan reviewed use of force and bias in the Police Department in response to community requests. Her office reached a settlement with Seattle in 2012, mandating changes that are ongoing. The reforms have included revamping how the department’s Force Investigation Team examines killings and other instances in which officers use force. She said she agrees with Oliver that mistrust of police is a problem and said the department should learn from the Lyles case. But she defended the recent reforms. “There has actually been a revolutionary change in how Seattle police officers are trained,” Durkan said. Mike McGinn, who as mayor negotiated the 2012 settlement, was less enthusiastic about the changes. Mayor Ed Murray moved too slowly in sending police-accountability legislation to the council and some policies remain unclear, such as whether a Taser should have been used against Lyles, McGinn said. The former mayor isn’t satisfied with the existing system for investigating the Lyles shooting and other police killings. Urban planner Cary Moon shared that view. Rather than invite an outside law-enforcement entity such as the State Patrol to investigate, the Community Police Commission should be involved, she said. Former state Rep. Jessyn Farrell expressed some confidence in the department’s ability to investigate, with caveats. During the short conversation, Oliver, McGinn and Moon didn’t say how specifically they would like to see the commission take part in investigations of police killings. Under the existing system, the Force Investigation Team probes the police department’s most serious uses of force, including shootings by officers. The results then are looked at by the Police Department’s Force Review Board to determine whether policy was followed and whether any lessons can be learned. The board has drawn praise from the federal monitor overseeing the 2012 agreement. Any conduct the board deems in violation of policy is referred to the Office of Professional Accountability, the department’s internal-investigation unit. The police chief reserves the final say on discipline. Investigation results additionally are submitted to the King County Prosecuting Attorney’s Office to determine whether criminal charges are warranted. The results can be used in public inquests. A state law makes it nearly impossible to prosecute officers who kill people in Washington; 213 people were killed by police statewide from 2005 to 2014, but only one officer was criminally charged in state courts — and he was acquitted. Under police-accountability legislation recently passed by the council, an independent, civilian Office of Inspector General would also provide oversight. Before the legislation can take effect, certain provisions must be negotiated with the Seattle Police Officers’ Guild, and a federal judge must sign off on the changes. Another leading candidate among 21 on the Aug. 1 ballot, state Sen. Bob Hasegawa, was in Olympia as the Legislature sought to pass a budget.